AVS Image Converter is software to convert images between many of the most popular formats including JPEG to GIF, GIF to PNG, PNG to JPEG, JPEG to PNG and between several vector image formats like SFW, PDD and ITHMB. AVS Image Converter can also add watermarks to your images should you wish. It isn't freeware, but can be obtained as a package of all products by AVS from their web site. For security reasons, you should also check out the AVS Image Converter download at LO4D.com which includes virus and malware tests. Additional screenshots of this application download may be available, too. 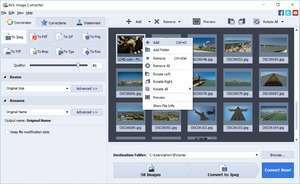 AVS Image Converter has a presence on social networks. AVS Image Converter download been highly rated by our users.